The counselling and psychotherapy professions have experienced a rapid growth and expansion throughout Europe, and internationally. State regulation of these professional practices has required personal development hours for those in training, continuing professional development for all qualified practitioners as well as supervision of their practice. Interacting Selves provides concepts and principles of personal and professional development (PPD) in training and supervision as part of an approach to lifelong learning for all those involved in psychotherapeutic work. Leading European trainers and practitioners draw on their shared background in systemic therapy to articulate a strong theoretical base for PPD. The volume functions not simply as a coherent description of the philosophy and rationale underlying PPD but also as a practice workbook whose chapters contain an array of elegantly crafted exercises, portable across the broad range of disciplines that give life to the social care and mental health fields at the same time as meeting the PPD needs of counsellors and psychotherapists of different theoretical persuasions. The approaches work through constant attention to PPD as an interpersonal process where　thoughts, ideas and emotions need to be nurtured. PPD can involve working at the extremes, and the book provides a secure basis for confronting abuse and violence head on. Each chapter shows how personal and professional development promotes a focus on emotional competence, positive emotion, resilience and ethical practice. 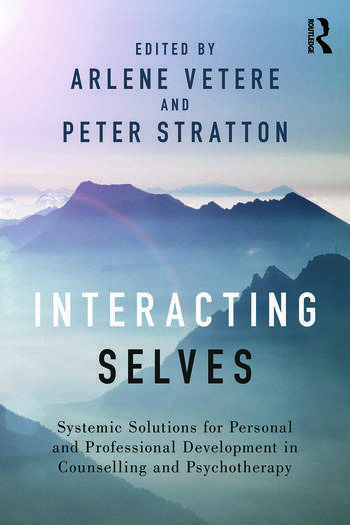 Interacting Selves introduces and develops the concepts and principles of personal and professional development (PPD) in training and supervision as part of an approach to lifelong learning for all psychotherapists undergoing or providing PPD. This pioneering book will appeal to psychotherapy trainees, trainers, practitioners and supervisors in the mental health field and social care professionals. Vetere, Stratton, Hanks, Jensen, Polychroni, Sheehan, Prologue and Introduction: Why we Wanted to Write This Book. Stratton, Hanks, PPD as Processes of Learning that Enable the Practitioner to Create a Self Equipped for Higher Levels of Professional Mastery. Jensen, Mind the Map: Circular Processes Between the Therapist, the Client, and the Therapist’s Personal Life. Hedvig Vedeler, Supervision: Present Within Movements. Hanks, Vetere, Working at the Extremes: The Impact of Doing the Work on us. Kohnstamm, Vetere, A Supervisor’s Progression: From Personal and Professional Development Training in Group Settings to the Inclusion of the Self of the Therapist in Supervision. Vetere, Dallos, Supervision and Attachment Narratives: Using an Attachment Narrative Approach in Clinical Supervision. Sheehan, Self and World: Narrating Experience in the Supervisor/Supervisee Relationship. Stratton, Vetere, Hanks, Hedvig Helmer Vedeler, Jensen, Polychroni, Sheehan, Conclusion: Consolidation, Celebration and Momentum. Arlene Vetere is professor of family therapy and systemic practice at Diakonhjemmet University College, Oslo, Norway; visiting professor of clinical psychology at Universita degli Studi di Bergamo, Italy; and affiliate professor of family studies at the University of Malta. She is a chartered clinical psychologist and systemic psychotherapist, and systemic supervisor, registered in the UK. Peter Stratton is emeritus professor of family therapy at Leeds University and Leeds Family Therapy & Research Centre, a systemic psychotherapist who is qualified in psychodynamic psychotherapy. He is a developmental psychologist with broad research interests and involvement in statutory processes that affect families. He is a chartered psychologist; Fellow of the British Psychological Society; UKCP accredited family therapist; and AFT accredited family therapy supervisor.